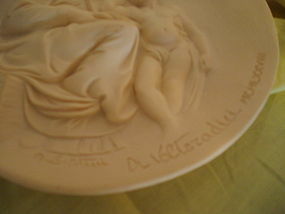 Bradford Exchange Living Madonna series Pensive Madonna 8.5" 3-D alabaster ivory plate. Nice condition. No cert or box available. From Bradford Exchange Under a Snowy Veil series, 4th issue plate First Snow, in original foam box. Cert of auth missing. From Bradford Exchange Under a Snowy Veil series, Snow Mates, in original box w/cert. of auth. Bradford Exchange Winter's Dawn, third plate in Under a Snowy Veil Series by Carl Sams. Cert. of Auth, in original foam box. 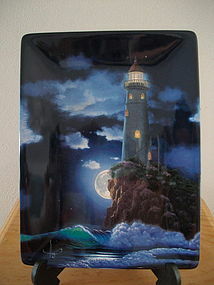 From Bradford Exchange, Al Hogue's I Am the Light Collector Plate, 1403 A, comes with cert. of auth. First plate in I Am the Light of the World series. In original foam box. 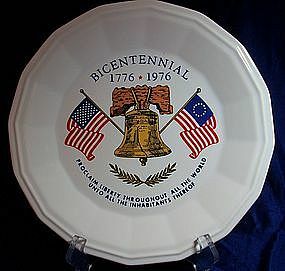 From Homer Laughlin China Co, a Bicentennial Collector Plate with the Liberty bell, the flag of 13 stars and 50 stars, Proclaim Liberty Throughout All The World Unto All The Inhabitants Thereof. Very nice condition with the exception of a chip on the back side, cannot be seen from the front. 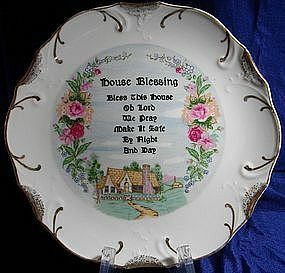 This gorgeous collector plate proclaims the House Blessing, floral detail around an old fashion cottage, 18K gold trim. Made in Japan for Mid State Products. Excellent condition. 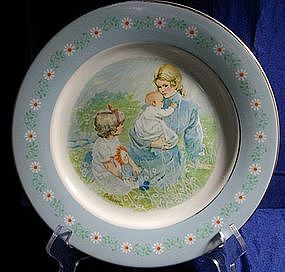 From Avon, "Tenderness" Commemorative Plate, Special edition awarded to Avon Representatives in January 1974. 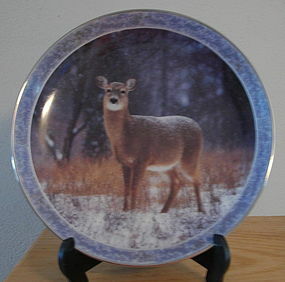 Plate made by Pontesa Ironstone, Spain. There is some wearing away of the gold trim but otherwise very good condition. 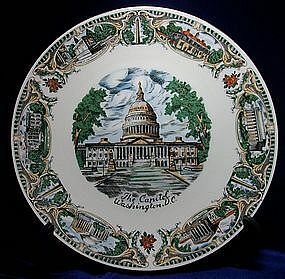 A very nice condition Collector Plate depicting our US Capitol, Washington DC. Colors of green and gold with dark orange, shows various attractions around the capitol city. 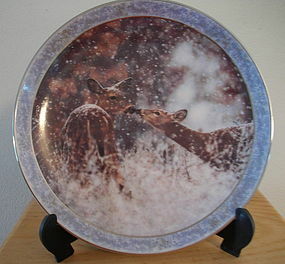 Plate is 8 1/2" diameter, Japan stamped on back in red. 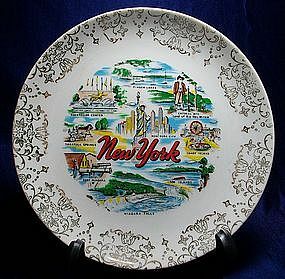 A collector plate for New York, 6 3/8" diameter. Gold filigree trim on rim, colorful center picture showing the various highlights of the state including Niagara Falls. Nice condition. 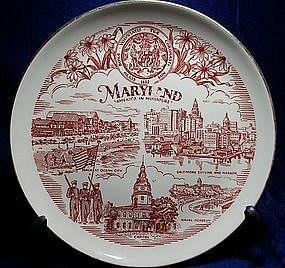 This collector plate is for the State of Maryland in the America in Miniature Series. 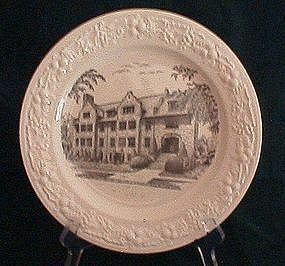 This is an older plate with gold trim on the rim, slightly faded, typical red print in the center with a spot of paint loos in the A of Maryland. Plate measures 7 1/4" diameter. No chips or cracks. 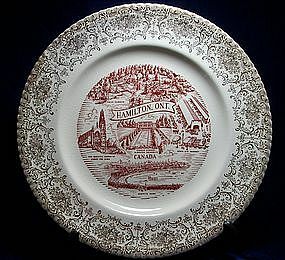 This is a nice collectible plate depicting Hamilton, Ontario, showing Rock Garden, Open-Air Market, The Basilica Church of Christ The King, Scotts Farm, and the Sunken Gardens of McMaster University. Typical dark red print with gold filligree around the outer rim. 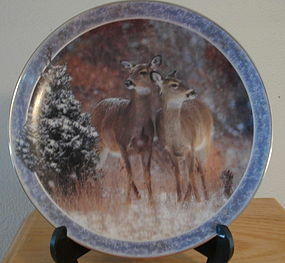 This plate has developed crazing but is in very nice condition otherwise. 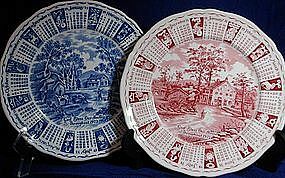 Alfred Meakin, Staffordshire England Calendar Plates. Nice condition. I have one in blue 1973, 4 red 1971, 72, 74, & 75. 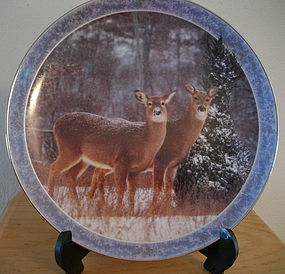 The picture on each plate is different with signs of the zodic and months of year around the rim. 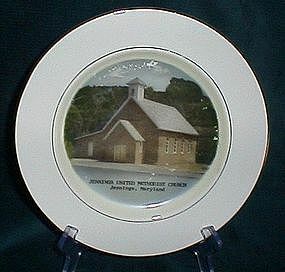 Jennings Maryland United Methodist Church collector plate by Preston-Hopkinson Co. 10" diameter, has a small amount of decal coming off as seen in the photo. No chips or cracks. 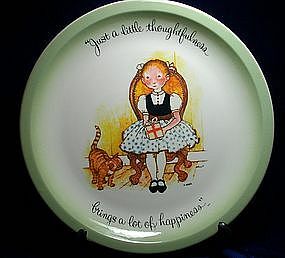 Lucile S Piper Memory Plate made by Homer Laughlin, pictures Catonsville MD Methodist Church circa 1947. Rev. Traygo W. Lloyd Minister. The plate is the Eggshell Theme. It does have a hairline fracture across the center, it is very fragile. A small chip in the fracture and a chip on the rim. Holly Hobby Collector's Edition, Made in USA American Greetings Corp. Excellent condition, about 10 1/4 in diameter. 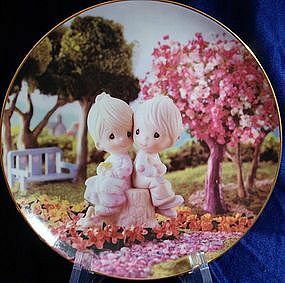 Precious Moments Love One Another Collector Plate by Enesco for the Hamilton Collection # 0555m 1993, Still in Foam box.